In January 2016, PS-AHAB researchers completed a cyst mapping survey in Hood Canal to determine whether the widespread bloom of Alexandrium in 2015 had “seeded” more of the area with resting cysts that could increase bloom risk this summer. The survey was conducted on the R/V Barnes from January 15-18, 2016, and was supported by the University of Washington Tacoma. The team revisited sites from previous surveys, as well as established new sites, particularly in southern Hood Canal. Emergency cyst mapping conducted in January 2015 found up to 120 and 180 cysts per cc wet sediment in Quilcene and Dabob Bays, respectively, following the unprecedented bloom of Alexandrium in 2014 in Quilcene Bay that contaminated shellfish with potent biotoxins. Prior to 2014, the area had been biotoxin free. 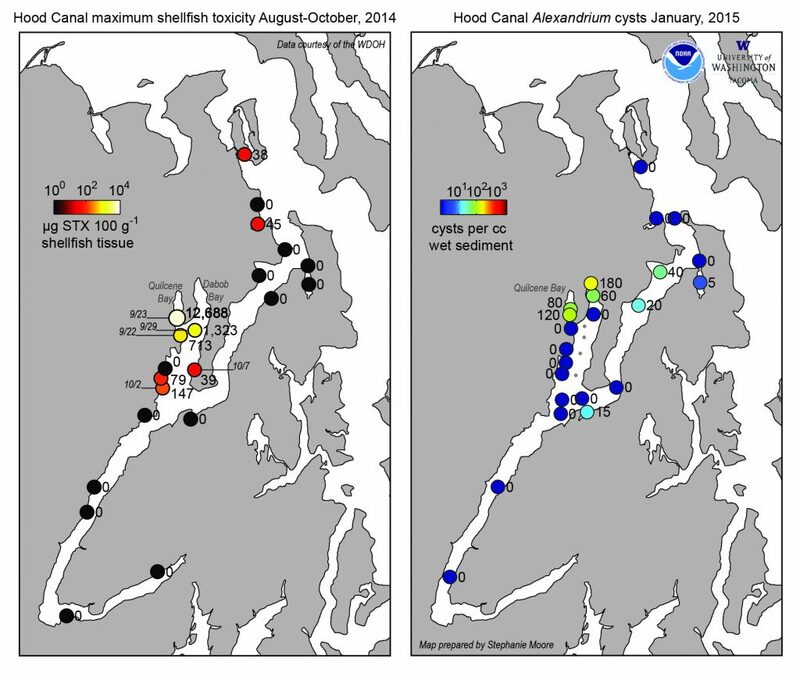 In January 2016, the maximum concentration of Alexandrium cysts found in the surface (0-1 cm) sediments of Hood Canal was 25 cysts per cc wet sediment in central Quilcene Bay. Up to 20 cysts per cc wet sediment were found in the surface sediments of Dabob Bay. This is an 86% decrease compared to the maximum concentration of cysts found in 2015. Low concentrations of cysts were found in southern Hood Canal at Union and Lynch Cove in 2016 for the first time. Fewer cysts may indicate a lower risk of blooms this summer compared to 2015; however, much uncertainty remains over Alexandrium bloom dynamics in Hood Canal and the relationship between winter cyst concentrations and shellfish toxicity the following summer. Therefore, our results call for the vigilant monitoring of cells and toxins in this area to continue through the 2016 season. 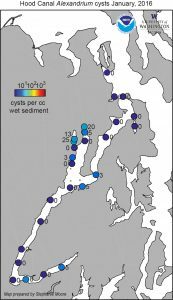 Preliminary results indicate that subsurface concentrations of Alexandrium cysts were higher that in the surface sediments at some Hood Canal sites in 2016. Sixty-five and 35 cysts per cc wet sediment were found in the 1-3 cm layer in Quilcene and Dabob Bays, respectively (data not shown). This indicates burial of cysts that were deposited here in 2014. No cysts were found in the 1-3 cm layer at Union and Lynch Cove, confirming that cysts were deposited in southern Hood Canal in 2015 for the first time. It is not clear why so few cysts were deposited in 2015. Even though Alexandrium species have been extensively studied around the world due to their human health and ecosystem impacts, our understanding of the mechanisms governing life cycle transitions in incomplete. This is especially true for the process of cyst formation. It is also possible that the 2016 survey missed any new deposits of cysts in smaller, shallower bays that were not accessible on this survey. Click image for high resolution copy of the map of the 2016 cyst mapping results in Hood Canal. In September and October 2014, there was an unprecedented bloom of Alexandrium in Quilcene Bay that contaminated shellfish with potent biotoxins. The area where the bloom took place has historically been biotoxin free. The regulatory limit for human consumption is 80 μg saxitoxin equivalents per 100 g shellfish tissue. At the peak of the event, the Washington State Department of Health detected toxin in shellfish at a concentration of 12,688 μg STX equiv. / 100 g. The cause of the particularly toxic bloom is yet to be determined. Species of Alexandrium produce resting cysts that overwinter in benthic sediments on the seafloor. The following season, the cysts germinate and can provide the inoculum for more blooms. Out of concern that the Quilcene Bay bloom formed a new “seed bed” (i.e., a concentrated area of cysts in benthic sediments) that could increase bloom risk this summer, PS-AHAB researchers initiated an emergency cyst mapping effort that was conducted on the University of Washington’s R/V Barnes from January 17-20, 2015. The work was supported in part by the NOAA ECOHAB Program and Penn Cove Shellfish. Previous cyst mapping efforts conducted as part of this project found zero or very low concentrations of cysts in the area; the highest concentration observed was 10 cysts per cc wet sediment in Quilcene Bay in 2013. in 2015, we found an order of magnitude greater concentration of cysts; up to 120 and 180 cysts per cc wet sediment in Quilcene Bay and Dabob Bay, respectively. Please note that no relationship has yet been identified between locations with high cyst abundances and shellfish toxicity in Puget Sound, and the number of cysts required to initiate a bloom has not yet been determined. These questions, and others, form the basis of research currently being conducted by the PS-AHAB research team. Nevertheless, our results warrant increased vigilance for monitoring cells and toxins during the 2015 season and beyond in this area. See the Craib Corer in action during the 2015 emergency cyst mapping in Quilcene and Dabob Bay. Video courtesy of Paul Hillman. The map below shows the final counts of Alexandrium cysts from a survey conducted in January and February 2013. Highest cyst concentrations were again found in Quartermaster Harbor in the south, and at levels similar to those observed in 2012. 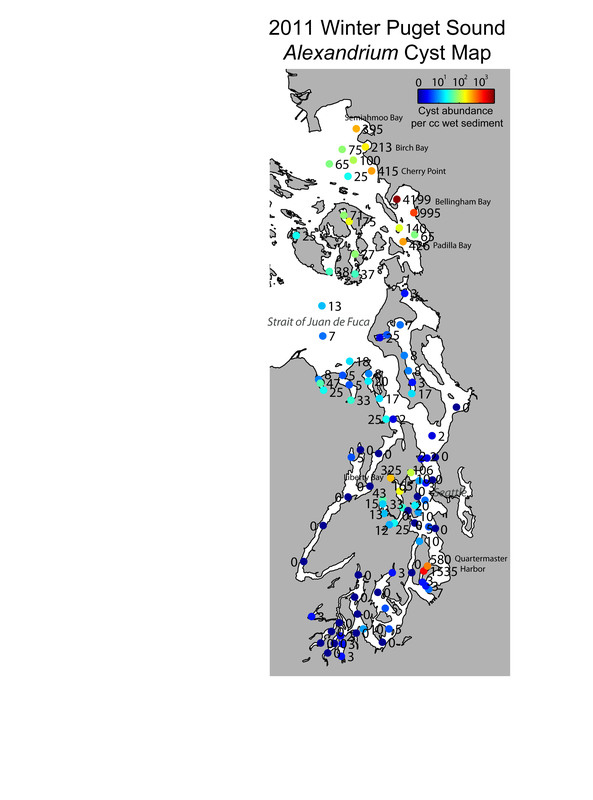 Liberty Bay and Bellingham Bay also had cyst concentrations; however, the levels observed in 2013 at Bellingham Bay are a factor of five fewer than those observed in 2012. 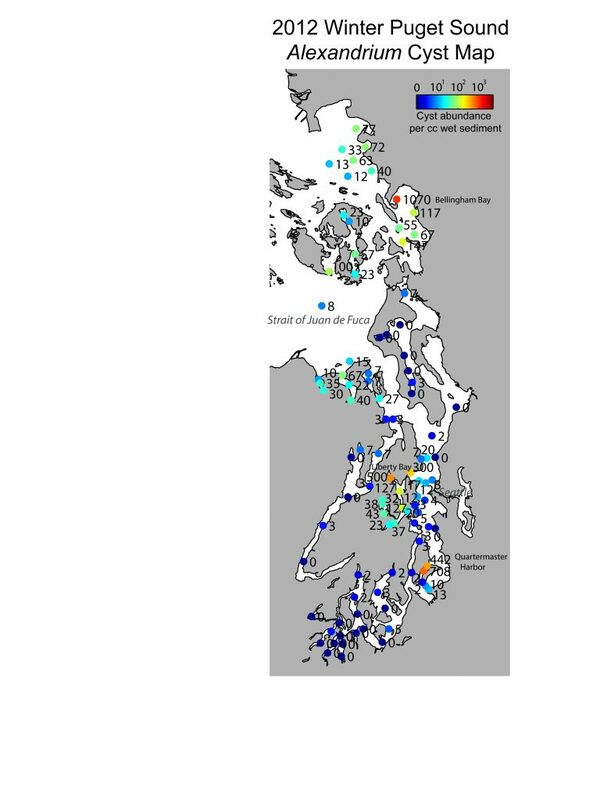 The Puget Sound Alexandrium Harmful Algal Bloom Research Program (PS-AHAB) released preliminary versions of all three years of cyst maps to stakeholders prior to the start of the bloom season increase to early warning capabilities for toxic bloom events. The Washington State Department of Health Public Health Laboratory analyzed 3,201 PSP samples in 2012. PSP toxin levels were much higher in 2012 compared to 2011, with the highest recorded value being 10,304 micrograms detected in mussels near Kingston. The Federal Drug Administration standard for PSP toxins in shellfish tissues is 80 micrograms per 100 grams of meat. There were 23 commercial sub-tidal geoduck clam tracts, 5 commercial general growing areas, and 31 recreational harvest areas closed in 2012 due to unsafe levels of PSP, and alarmingly there were 9 reported PSP illnesses reported from people consuming blue mussels from areas that were closed to recreational shellfishing. This information was kindly provided by Jerry Borchert, and will assist the PS-AHAB Program to identify relationships between bloom events the previous summer, cyst deposition and the formation of overwintering “seed beds”, and the potential for blooms the following summer. The map below shows the final counts of Alexandrium cysts from a survey conducted in January and February 2012. 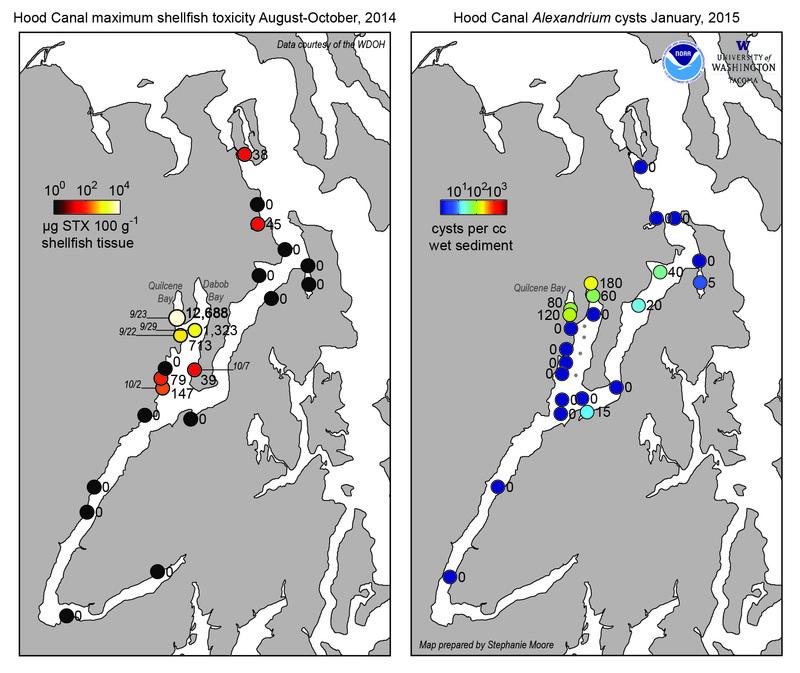 Highest cyst concentrations were found at Bellingham Bay in the north and Quartermaster Harbor in the south. This pattern of cyst abundance is similar to that found in 2011; however, Sound-wide cyst abundances in 2012 are less than those found in 2011 by a factor of 2 or more. The Washington State Department of Health Public Health Laboratory analyzed 2,804 PSP samples in 2011. 2011 PSP levels were lower compared to 2010, with the highest recorded value being 954 micrograms. There were eight commercial sub-tidal geoduck clam tracts and two commercial general growing areas closed in 2011 due to PSP, but there were no reported PSP illnesses. This information was kindly provided by Jerry Borchert and will assist the PS-AHAB Program to identify relationships between bloom events the previous summer, cyst deposition and the formation of overwintering “seed beds”, and the potential for blooms the following summer. The map below shows the final counts of Alexandrium cysts from a survey conducted in January and February 2011. 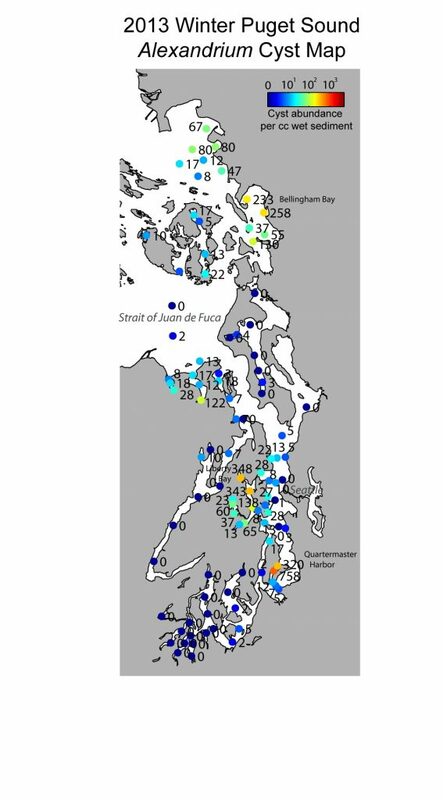 Highest cyst concentrations were found at Bellingham Bay in the north and Quartermaster Harbor in the South. The Washington State Department of Health Public Health Laboratory analyzed 3,135 PSP samples in 2010. PSP levels in 2010 were very high and set many new “All Time High Records” in 2010. Of the 26 locations that had PSP test over 1,000 micrograms, 24 were new records. Despite the high toxin levels, there were no reported PSP illnesses in 2010. Record PSP levels were recorded on the outside coast, in the Strait of Juan de Fuca, and North Puget Sound. There was an unusual event in South Puget Sound that did not have real high test results but was particularly troublesome to the shellfish industry as it caused a number of shellfish closures. There were 20 commercial sub-tidal geoduck clam tract closures, 11 commercial shellfish growing area closures, and 2 commercial recalls due to PSP in 2010. This information was kindly provided by Frank Cox and will assist the PS-AHAB Program to identify relationships between bloom events the previous summer, cyst deposition and the formation of overwintering “seed beds”, and the potential for blooms the following summer.